Vinnies is delighted to be partnering with IGA again this Christmas. IGA have been a National Partner of the Vinnies Christmas Appeal since 2012. Through the sales of IGA Community Chest products and Vinnies Christmas Baubles, over this time IGA has raised more than $1.5 million. The funds have helped Vinnies provide food and vital support to thousands of people experiencing homelessness and disadvantage across Asutralia. 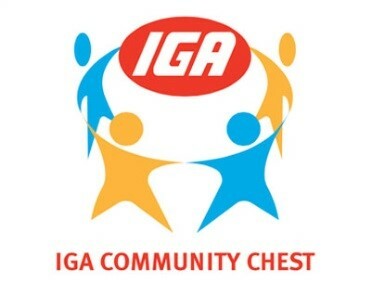 To support Vinnies this Christmas, you can purchase a specially marked Community Chest product from the 5-26 December 2018 at participating IGA stores. Each year, Vinnies provides more than $100 million in support to people experiencing poverty and disadvantage. This includes crisis accommodation, food, assistance with paying bills, clothing and furniture. Vinnies provides assistance on more than 1.3 million occasions per year. For example, Vinnies provides people struggling to make ends meet with basic food hampers and supermarket vouchers. In the last financial year, Vinnies provided people in need with more than 1.5 million meals and nearly 700,000 bed nights. Sadly, over the Christmas and New Year period the need only intensifies. Your kind support through IGA and the Vinnies Christmas Appeal allows us to continue to rebuild lives and restore hope. IGA has over 1,400 stores nationally, all of which continuously help to support their local communities. Please click here to find your local IGA store and help Vinnies by supporting your local IGA store this Christmas.